Tutorial on Towards Solving Real-World Vision Problems with RGB-D Cameras, Portland, OR, USA, June 2013, in conjunction with CVPR'13. Organizers: Xiaofeng Ren (Amazon), Pushmeet Kohli (Microsoft Research Cambridge), and Juergen Gall (Max Planck Institute for Intelligent Systems). The CVPR'12 paper Interactive Object Detection has been nominated for the ITG Innovation Award. Souce code for the CVPR'12 paper Real-time Facial Feature Detection using Conditional Regression Forests has been released. Data for the ECCV'12 paper Motion Capture of Hands in Action using Discriminative Salient Points has been released. The work on Real Time Head Pose Estimation presented by Gabriele Fanelli wins 3rd prize of the Kinect gesture demo competition at CVPR'12. Source code is available. Workshop on Consumer Depth Cameras for Computer Vision, Firenze, Italy, 12 October 2012, in conjunction with ECCV'12. Organizers: Andrea Fossati (ETH Zurich), Juergen Gall (Max Planck Institute for Intelligent Systems), Helmut Grabner (ETH Zurich), Xiaofeng Ren (Intel Labs), Kurt Konolige (Willow Garage), Seungkyu Lee (Samsung Advanced Institute of Technology), and Miles Hansard (Queen Mary University London). Visual Understanding and Applications with RGB-D Cameras, Journal of Visual Communication and Image Representation (JVCI). 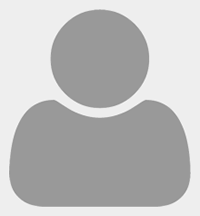 Guest Editors: Michael Beetz (TU Munich), Daniel Cremers (TU Munich), Juergen Gall (Max Planck Institute for Intelligent Systems), Wanqing Li (University of Wollongong), Zicheng Liu (Microsoft Research Redmond), Dejan Pangercic (TU Munich), Juergen Sturm (TU Munich), and Yu-Wing Tai (KAIST). Tzionas, D., Ballan, L., Srikantha, A., Aponte, P., Pollefeys, M., Gall, J. Hand motion capture is a popular research field, recently gaining more attention due to the ubiquity of RGB-D sensors. However, even most recent approaches focus on the case of a single isolated hand. In this work, we focus on hands that interact with other hands or objects and present a framework that successfully captures motion in such interaction scenarios for both rigid and articulated objects. Our framework combines a generative model with discriminatively trained salient points to achieve a low tracking error and with collision detection and physics simulation to achieve physically plausible estimates even in case of occlusions and missing visual data. Since all components are unified in a single objective function which is almost everywhere differentiable, it can be optimized with standard optimization techniques. Our approach works for monocular RGB-D sequences as well as setups with multiple synchronized RGB cameras. For a qualitative and quantitative evaluation, we captured 29 sequences with a large variety of interactions and up to 150 degrees of freedom. Hough-based voting approaches have been successfully applied to object detection. While these methods can be efficiently implemented by random forests, they estimate the probability for an object hypothesis for each feature independently. In this work, we address this problem by grouping features in a local neighborhood to obtain a better estimate of the probability. To this end, we propose oblique classification-regression forests that combine features of different trees. We further investigate the benefit of combining independent and grouped features and evaluate the approach on RGB and RGB-D datasets. Tzionas, D., Srikantha, A., Aponte, P., Gall, J. Hand motion capture has been an active research topic in recent years, following the success of full-body pose tracking. Despite similarities, hand tracking proves to be more challenging, characterized by a higher dimensionality, severe occlusions and self-similarity between fingers. For this reason, most approaches rely on strong assumptions, like hands in isolation or expensive multi-camera systems, that limit the practical use. In this work, we propose a framework for hand tracking that can capture the motion of two interacting hands using only a single, inexpensive RGB-D camera. Our approach combines a generative model with collision detection and discriminatively learned salient points. We quantitatively evaluate our approach on 14 new sequences with challenging interactions. In order to avoid an expensive manual labeling process or to learn object classes autonomously without human intervention, object discovery techniques have been proposed that extract visual similar objects from weakly labelled videos. However, the problem of discovering small or medium sized objects is largely unexplored. We observe that videos with activities involving human-object interactions can serve as weakly labelled data for such cases. Since neither object appearance nor motion is distinct enough to discover objects in these videos, we propose a framework that samples from a space of algorithms and their parameters to extract sequences of object proposals. Furthermore, we model similarity of objects based on appearance and functionality, which is derived from human and object motion. We show that functionality is an important cue for discovering objects from activities and demonstrate the generality of the model on three challenging RGB-D and RGB datasets. Dantone, M., Gall, J., Leistner, C., van Gool, L.
In this work, we address the problem of estimating 2d human pose from still images. Recent methods that rely on discriminatively trained deformable parts organized in a tree model have shown to be very successful in solving this task. Within such a pictorial structure framework, we address the problem of obtaining good part templates by proposing novel, non-linear joint regressors. In particular, we employ two-layered random forests as joint regressors. The first layer acts as a discriminative, independent body part classifier. The second layer takes the estimated class distributions of the first one into account and is thereby able to predict joint locations by modeling the interdependence and co-occurrence of the parts. 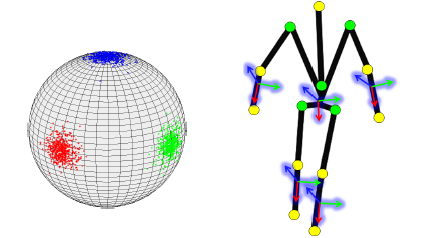 This results in a pose estimation framework that takes dependencies between body parts already for joint localization into account and is thus able to circumvent typical ambiguities of tree structures, such as for legs and arms. In the experiments, we demonstrate that our body parts dependent joint regressors achieve a higher joint localization accuracy than tree-based state-of-the-art methods. Benchmarking methods for 3d hand tracking is still an open problem due to the difficulty of acquiring ground truth data. We introduce a new dataset and benchmarking protocol that is insensitive to the accumulative error of other protocols. To this end, we create testing frame pairs of increasing difficulty and measure the pose estimation error separately for each of them. This approach gives new insights and allows to accurately study the performance of each feature or method without employing a full tracking pipeline. Following this protocol, we evaluate various directional distances in the context of silhouette-based 3d hand tracking, expressed as special cases of a generalized Chamfer distance form. An appropriate parameter setup is proposed for each of them, and a comparative study reveals the best performing method in this context. Fanelli, G., Dantone, M., Gall, J., Fossati, A., van Gool, L.
We present a random forest-based framework for real time head pose estimation from depth images and extend it to localize a set of facial features in 3D. Our algorithm takes a voting approach, where each patch extracted from the depth image can directly cast a vote for the head pose or each of the facial features. Our system proves capable of handling large rotations, partial occlusions, and the noisy depth data acquired using commercial sensors. Moreover, the algorithm works on each frame independently and achieves real time performance without resorting to parallel computations on a GPU. We present extensive experiments on publicly available, challenging datasets and present a new annotated head pose database recorded using a Microsoft Kinect. Liu, Y., Gall, J., Stoll, C., Dai, Q., Seidel, H., Theobalt, C.
Capturing the skeleton motion and detailed time-varying surface geometry of multiple, closely interacting peoples is a very challenging task, even in a multicamera setup, due to frequent occlusions and ambiguities in feature-to-person assignments. 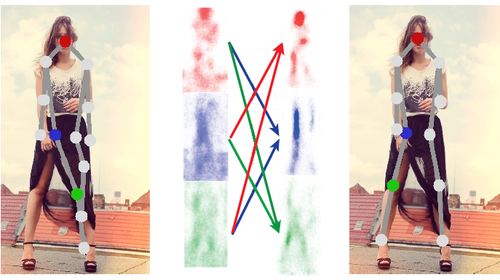 To address this task, we propose a framework that exploits multiview image segmentation. To this end, a probabilistic shape and appearance model is employed to segment the input images and to assign each pixel uniquely to one person. Given the articulated template models of each person and the labeled pixels, a combined optimization scheme, which splits the skeleton pose optimization problem into a local one and a lower dimensional global one, is applied one by one to each individual, followed with surface estimation to capture detailed nonrigid deformations. We show on various sequences that our approach can capture the 3D motion of humans accurately even if they move rapidly, if they wear wide apparel, and if they are engaged in challenging multiperson motions, including dancing, wrestling, and hugging. Pons-Moll, G., Leal-Taix’e, L., Gall, J., Rosenhahn, B.
Dantone, M., Gall, J., Fanelli, G., van Gool, L.
Razavi, N., Gall, J., Kohli, P., van Gool, L.
Pellegrini, S., Gall, J., Sigal, L., van Gool, L.
Yao, A., Gall, J., Leistner, C., van Gool, L.
Fanelli, G., Gall, J., van Gool, L.
Ballan, L., Taneja, A., Gall, J., van Gool, L., Pollefeys, M.
Razavi, N., Alvar, N., Gall, J., van Gool, L.
L’opez-M’endez, A., Gall, J., Casas, J., van Gool, L.
Ristin, M., Gall, J., van Gool, L.